One thing that I noticed during my research into this story, is that no one had ever written about Alonzo or his house before, at least nothing online anyway. I could find no trace of any books mentioning it either. So what I am sharing with you is straight from the sources and just as they appeared in the headlines back at the turn of the century (or before). 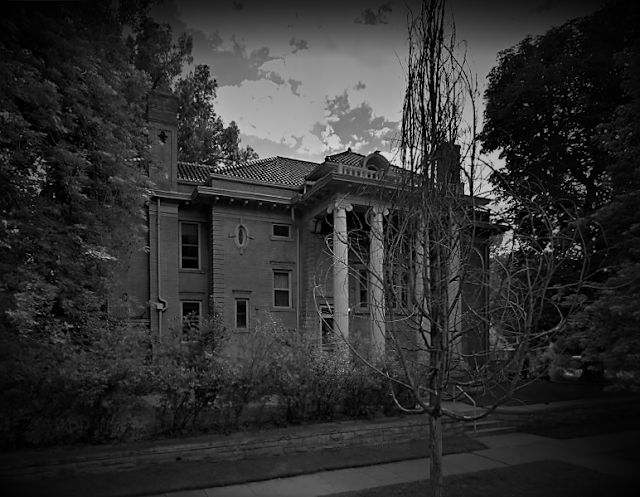 The house that is situated on Humboldt Street in Denver, looks like any other beautiful, stately mansion, but it’s not just the house itself that intrigued me, but instead what happened inside this home that has pulled me in so much that I was compelled to write about it. Before getting to all the particulars of the home’s eccentric history, first let me start out with the history of its very first owner, Alonzo Thompson. Alonzo Thompson was born on February 22, 1832, in the town of Centerville, Illinois to parents Amos and Irene Thompson. The 1850 Census for St. Clair County, Illinois lists Alonzo as a “student” living with his parents along with his brothers and sisters. His father, Amos was listed as a “Farmer” although he was much more than that as I will highlight later on. When Alonzo was just 20 years old his mother Irene passed away. Alonzo graduated from McKendree College in Lebanon, Illinois, and he was one of 16 founders of the Platonian Literary Society. Alonzo began teaching at a private school in Belleville, Illinois after graduating college, and he traveled to Maryville, Missouri and Louisiana to teach there as well. His obituary noted that from 1856 to 1861 he took charge of the local Union troops, and later was elected into local Missouri Legislature in 1862. By 1864, he had become the Missouri State Auditor. He remained in that position for four years, but in that time frame he also found himself in a huge scandal that sullied his name. 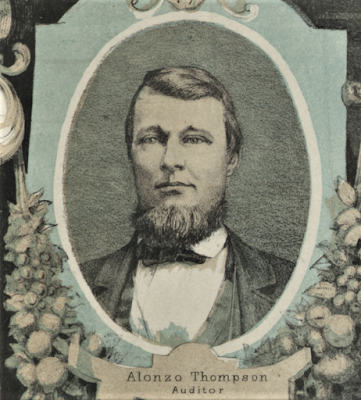 By 1868-1867, Alonzo became a real estate entrepreneur in St. Louis, and eventually moved back to Maryville, Missouri. 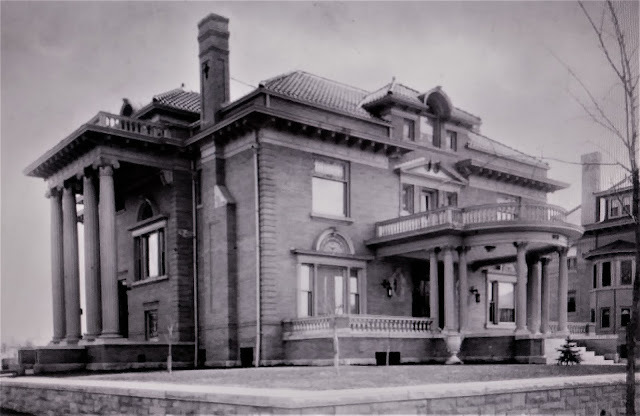 Soon he went on to promote a railroad that went from St. Louis to Omaha, and even later settled in an Indian Reservation, building a beautiful and large home in Fullerton, Nebraska. Census records list him as a Capitalist, or Land Agent (real estate). Alonzo was married three times during his life. His first marriage was on December 6, 1857, to Mary Visonhaler. This union brought forth three children: Hattie, Fannie and Elmer. Fannie died at just four months old. Elmer died when he was 26 years old. 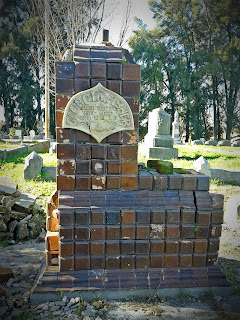 His wife, Mary passed away on March 1, 1877. His daughter, Hattie outlived both her mother and father. His second marriage was on April 12, 1880, to Mary Adams. She died exactly one year and a day later on April 13, 1881. They had no children together. His third and final marriage, to which he would later regret was to one Annie Elizabeth (Heard) Jones, on October 30, 1881, only six months after his second wife had passed. The couple had one son together, Alonzo Thompson, Jr. So, Alonzo’s story really doesn’t take a turn for the strange and mysterious until he married his third wife, Annie, which was a huge mistake on his part. It was during a séance with a medium known as Mrs. Lively in 1881, Alonzo was told to marry Annie, the divorced wife of Knox Jones. In another séance he was warned not to marry her, and later he claimed that was the one and only time he “disobeyed” advice from the spirit world. You see, Alonzo was a spiritualist and had been dabbling in that field ever since the death of his mother in 1852. In the book “What Converted Me To Spiritualism,” Alonzo was given an entire chapter that tells his account of his original skepticism of life after death and what convinced him to believe otherwise. When he met Annie, she too was also involved in spiritualism. As years went on though Alonzo realized that she had been playing games with him, and he believed she had deceived him completely from the very beginning, pretending to be truly interested in his other worldly interests in order to entice or trap him by “appealing to the spirits in which the widower believed thoroughly to be the first aid to cupid.” She also gave him hundreds of letters that were purported to have been scribed by the spirits of his dead loved ones. Later on he stated that he felt all those letters were completely fabricated to make him believe she somehow had a direct line to those he missed. He also admitted that Annie managed to use her “connection” with the dead to “induce him to part with large sums of money.” Basically she was a gold digger. After building a beautiful home in Fullerton, Nebraska and living there for a good twenty years or so, they just up and left, moving this time to Denver, where he would construct his magnificent 9 bedroom, 6 bathroom home on Humboldt Street in 1905, after purchasing four adjoining lots from Mr. Moffat. It appeared that by the turn of the century Alonzo and his family went from doing so-so to living a moderately wealthy lifestyle. The question was how? What changed? The secret room that is hidden within the home was so secret even his own wife and son were never allowed to enter. 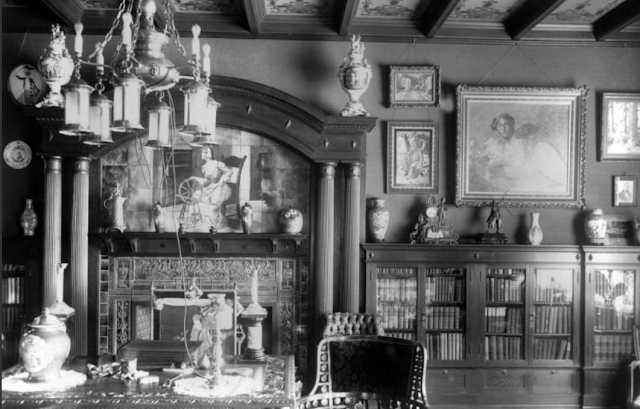 To this day no one has ever written about the home besides what we find in archived newspaper clippings from 1912, so there is no way to know if the room was discovered by future owners down the line or if it remains still, a hidden room. By 1912, Alonzo had just about enough of his marriage to Annie and filed for divorce, seeking not only to keep his newly made millions from her grasp but also to disinherit his son, too. But why? Well, according to the newspapers of the time, Alonzo claimed that his wife and son were conspiring against him and that they intended to have him committed. According to Alonzo, they had been following him all over, even from state to state where he owned several properties, seeking to have the authorities arrest him and lock him up in an asylum. He was convinced that they wanted to take all control over his estate, and were going to use his “spiritualism” as an excuse to claim he was senile. Alonzo stated that his father’s ghost had warned him that this was going to take place, and so he preemptively made the first move. Using his attorney, James A. Harris, Alonzo transferred or converted over $500,000 worth of property into cash that his wife and son could not get their hands on. He also changed his will, leaving his wife out and making conditions that his son could not inherit a dime of his estate unless he proved over a length of time that he could “be a man” and support himself. He felt his son was spoiled and needed to learn how to earn a living, instead of riding on the back of daddy’s coattails for the rest of his life. Once Alonzo filed his petition for divorce, Annie filed a counter claim, ultimately spilling the beans on her husband's licentious dalliances. It didn’t stop there. Annie went on to make the most surprising and humorous claim that Alonzo was also having dinner with the spirits of dead women. Of course you can imagine that the newspapers had a field day with this accusation, even going so far as to have the newspaper sketch artist draw up some sensationalized drawings of Mr. Thompson sitting in his “secret chamber” dining separately with the ghost of Cleopatra and Dido. Her list also included such names as: Sappho, Nell Gwynn and Juliette Recamier. But it wasn’t just his “dead affairs” Mrs. Thompson was worried about. You see, moving to Denver didn’t seem to stop Alonzo’s wavering eye, and soon he caught sight of yet another woman. This time it was Mrs. Noyes, who lived on Lincoln Street. Apparently, Annie started to notice that every time Mrs. Noyes would go on long trips out of town, so would her husband, so she decided to start following them and found that they were having an affair. According to Annie, her husband became obsessed with Mrs. Noyes, who claimed to have some power to use her body to communicate with his dead father. It appeared that Annie was no longer manipulating her husband, and now he had a new love interest who was sinking her claws into Alonzo’s back, and his pocket book. Alonzo Thompson’s estate comprised of his stately mansion, and a combined worth of millions of dollars of property that spanned from Denver, Tennessee, Nebraska, Missouri and North Dakota. In the end he did leave a share of his estate to his son, “provided that he makes a man of himself within a reasonable time.” The rest of his estate he bequeathed to charity and “benevolent institutions” to the promotion of spiritualism. On April 10, 1913, Alonzo passed away at the age of 81 after battling a long illness. The newspapers claimed he had boasted that he had been told by the "other side" he would live to be 96, but obviously that was not to be. Shortly after his death, his body was taken from Denver and buried at Green Mount Protestant Cemetery in Belleville, Illinois. But this story is far from over. According to the November 26, 1913 issue of the San Francisco Call, it states that according to the keepers of the property, a “ghost” made an appearance every evening in the home. Now of course the newspaper assumed it was Alonz, given the fact he had just passed away seven months prior, but if you recall, it was Alonzo who claimed that his father’s ghost would visit nightly like clockwork to visit with him in his hidden room. So who or what was creating such a stir in the home? Unfortunately, no more could be found about the home or its “haunted history” after that one article. Recently, I reached out to the current owners of the home but I have yet to receive a response back from them. I was hoping I could speak to them firsthand to hear what they have to say about the mansion, whether or not they know about this secret room, and whether they feel it’s a “haunted mansion” or not. Unfortunately, I have yet to communicate with the owners of the home to see if they have something to add to this story so I cannot give you a definitive answer. Still, Alonzo Thompson’s personal story alone is one built on a lot of secrets, scandals and ultimately superstition. Was his home ever truly haunted, or was that a farce all along? Did he really communicate with the other side, or was he just a very clever con-man? Who told the truth between his or his wife’s stories, or was the truth found somewhere in between? And lastly, was Alonzo Thompson insane as his wife and son claimed, or were they just after his money the whole time? So many questions that we may never find all the answers to. A special thanks to Coi Drummond-Gehrig at the Denver Public Library for photo permissions! and a big thanks also to John Marshall for added research! “What Converted Me To Spiritualism- 100 Testimonies,” (pg 33-34) Circa 1901. Genealogical and Family History of the State of Maine – (Lewis Historical Publishing Company, 1909). Labels: Affairs with Ghosts, Alonzo Thompson, Colorado, Denver, Denver Haunted House., Haunted Denver, Haunted Mansion, Missouri Auditor, Spiritualism, Superstition. Ione, California is famously known for its archaic structure that towers above the small town, up on the top of the hillside known as Preston Castle. Years ago, I wrote a book on some of the famous and infamous events that took place at that castle as well as early history that had been long forgotten. Well, it turns out that the castle isn't the only thing in town made from that dark red sandstone, which is the same color of the red clay hills that surround the area. There is one headstone in the Ione Public Cemetery that bears the same color and stone, too, which Preston Castle is best known for. 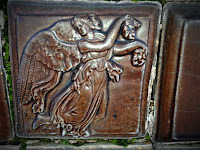 The stone was a mystery to many who would visit the cemetery. 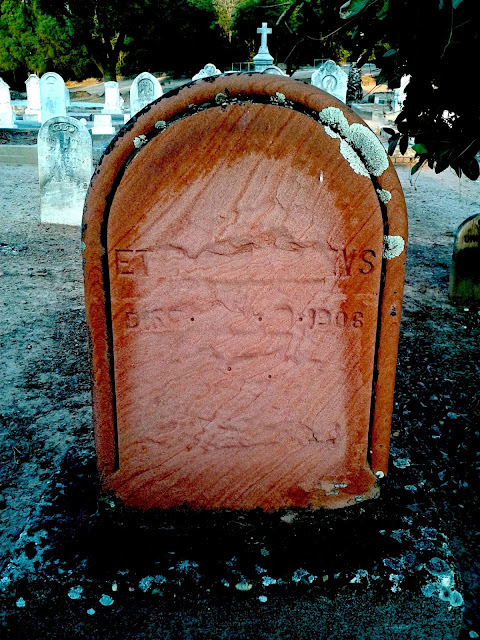 At first glance it appears that either time and the elements had washed away grooves into the stone, wiping the name and dates etched in the marker. It also appears that this could have been done by a person, too, but I hope that was not the case. 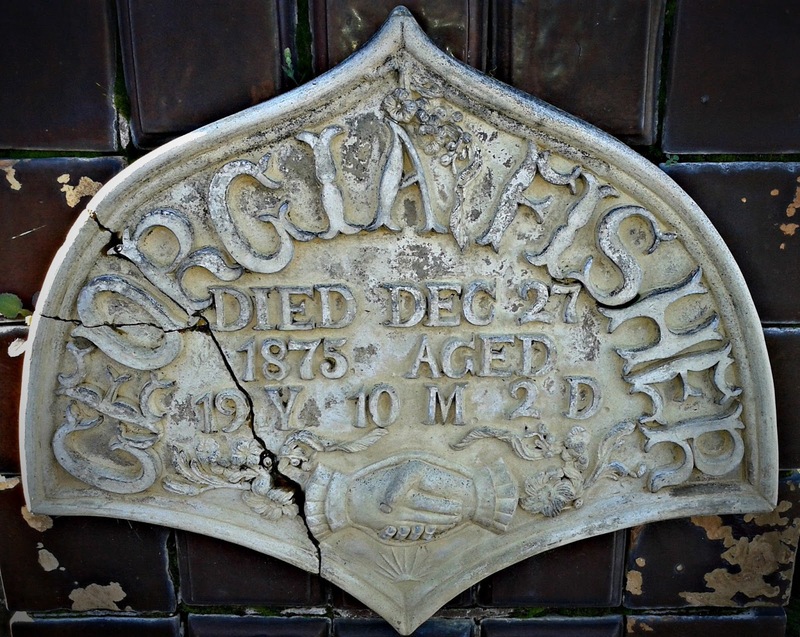 Nevertheless, the identity of this grave had elluded many searching for it. It was a hard thing, the first letters of the first name appear to be "ET" while the last letters of the last name read "WS" (or so we thought!) One thing clearly visible was the year of death, 1906. 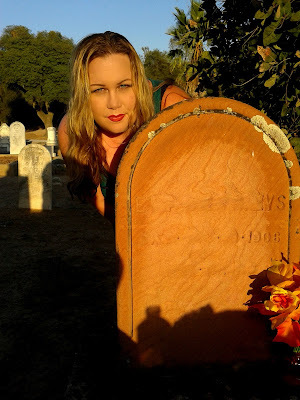 I searched the death records for Amador County based on the year, to no avail. I even did a search in the Find-a-grave database for the cemetery and the cemetery index for any person whose name matched those letters, in both first and last names. Still nothing. It was after posting the photo above on Facebook that a few of my friends got involved to help me figure out this mystery. Robert Mitchell, who is a historical researcher out of Louisville, was able to figure out that her name was Ettie Humphreys (although the cemetery had it under the name Humphries). Upon further research into the archived newspapers, the May 11, 1906 edition of the Amador Ledger reveals her tragic story. Mina Etta "Ettie" Russell was born on February 21, 1870, in Ohio. When she was just a baby, her parents moved to California, near Buena Vista. 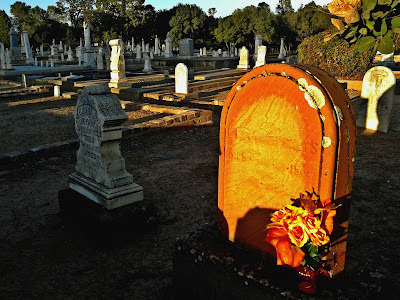 Later they moved to Chico and remained until 1880, when her mother passed away. After the death of her mother, nine-year-old Ettie was moved from home to home, first living with Mrs. William Cook in Buena Vista, and then Mr. and Mrs. J.C. Norris, where she remained until she was married. 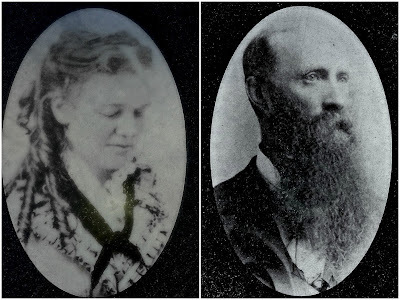 Ettie married George Humphreys in Amador County on February 23, 1890. She was 19 years old and he was 31. George had two sons from his previous marriage, Miles and Jimmy, (both were born in 1882 and 1884). By 1900, the Humphreys' were living in the Consumnes Township of El Dorado County, and her legal name was stated as "Nina E. Humphreys." It is unknown when she moved back to Amador County. According to the Amador Ledger article, Ettie was a "noble woman, always ready and willing to led a helping hand to those in need, and a loving mother, her first thought being of her boys." This is very telling, especially since the two boys were not her biological children. 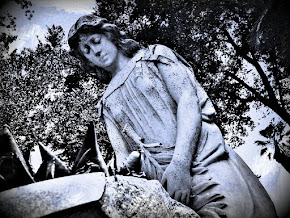 Her heart must have been extremely loving and open, because she died on her way to help those who were affected in the Great Earthquake of 1906. In fact, it was only three days after the earthquake that left the bay area devastated with destruction, that she was determined to go and help locate friends and family who were displaced after their homes were destroyed. The "car" as it is mentioned must have been a street car or trolley of some sort. The article goes on the state that her body was brought to Ione, California for interment to be next to her mother, Eliza Jane Russell. The Rev. Hinkson of the Presbyterian Church conducted the services. What is really neat about Ettie's grave, despite the fact that it is worn so badly you cannot read it, is that hers is the only red sandstone marker in the entire cemetery. 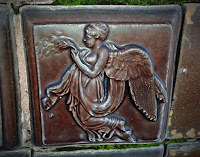 Not only that, but in all the years I have been roaming cemeteries I have never come across a red sandstone marker like hers. That alone is a truly unique thing! In ending, let us remember Mrs. Ettie Humphreys, a kind and caring woman who died on her way to help others. She was only 36 years old, and a mother of two boys. After learning of her life and death, I felt that I could relate to her in many ways, as I am about her age and also a mother of two boys. I can only imagine that her last thoughts were of her husband and those two boys. To Ettie Humphreys, may you never be forgotten ever again! Thank you Rob Mitchell for all your help! Last Halloween, when I was driving my son home from work, and happened to be switching radio stations, I heard the mention of a "lady in white" frequently sighted in Nob Hill, San Francisco. The name of this alleged specter was presumed to be Flora Somerton. The story relayed over the airwaves was brief but mentioned that the young lady mysteriously disappeared from a ball one night in 1876, only to be discovered 50 years later, dead in the same dress she had been seen wearing the night she vanished. The DJ was not very clear about what had happened to Flora during those 50 years. Was she dead all that time and they only discovered her body 50 years later? Or did she die 50 years later? I was intrigued by this story, even the just the small tidbits I heard over the radio, so I decided to go home and see if there was any truth to this story or not. First, I searched her name and every variation of it: Flora Somerton, Flora Sommerton and Flora Summerton. Besides the many links to websites mentioning the story in almost a scripted, (copied and pasted) regurgitation of the same story, there was not one website that cited any concrete sources of where they got their information. It appears that each person copied from the other person, and so on, leaving the internet inundated with sites mentioning her story, but not really detailing facts. 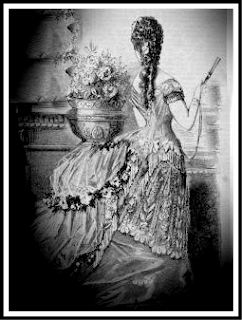 Several "paranormal" authors mention her story as fact in their books, claiming that she was a real person who really disappeared in 1876. They go on to state that she was engaged to be married to someone her parents set up (basically betrothed), and that at her "coming out" ball she took off and disappeared. 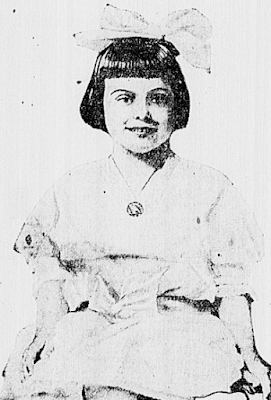 Several writers claim that her family were socialites in San Francisco's high society and that they offered large rewards for any information leading to Flora. There are mentions of $250,000.00 being offered as a reward from her family, as well as noting that the newspapers all over the country published this mystery. 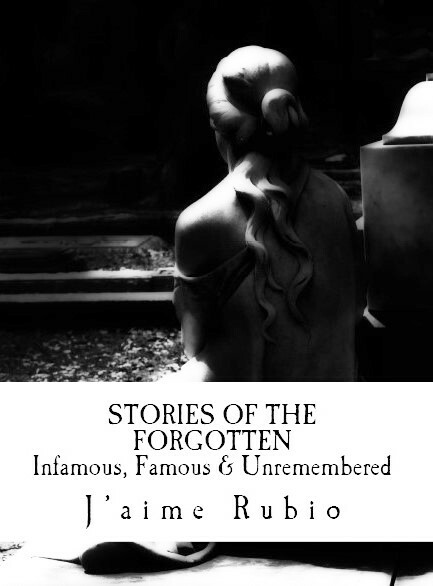 Then the story goes on that nearly 50 years later, an indigent woman going by the name "Mrs. Butler" dies in Butte, Montana, and that when her body is discovered, she is found with the dress and newspaper clippings about Flora's disappearance in 1876. Allegedly the authorities put two-and-two together, leading to the conclusion Mrs. Butler is actually Flora Somerton and she is brought back to her family plot to be buried. The ghost story surrounding Flora claims that she haunts California Street, between Jones and Powell Streets, where she once lived. This is close to the Fairmount Hotel. She is known as the "Ghost Bride of Nob Hill" or the "Lady in White." In theory the alleged history of this woman's story sounds interesting, but I could not find any facts to substantiate any of these claims. Although these previous writers claim there were newspaper articles laying out the entire story from her disappearance to the discovery of her body half a century later, none of these writers ever cite the sources they used to base their conclusions on. 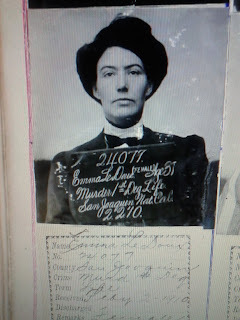 I diligently searched every archive database I could find and came up with no newspaper articles of that time period showing that any woman named Flora Somerton had been missing, nor were there any records in Butte, Montana, showing her death, or the death of this "Mrs. Butler," in 1926. In reality, it appears that there was no Flora Somerton (spelled any way you try)....and if there had been, she did not live in San Francisco. There are no records of birth, death, census records, voting registries, nothing with Flora's name or anything that remotely comes close to it. 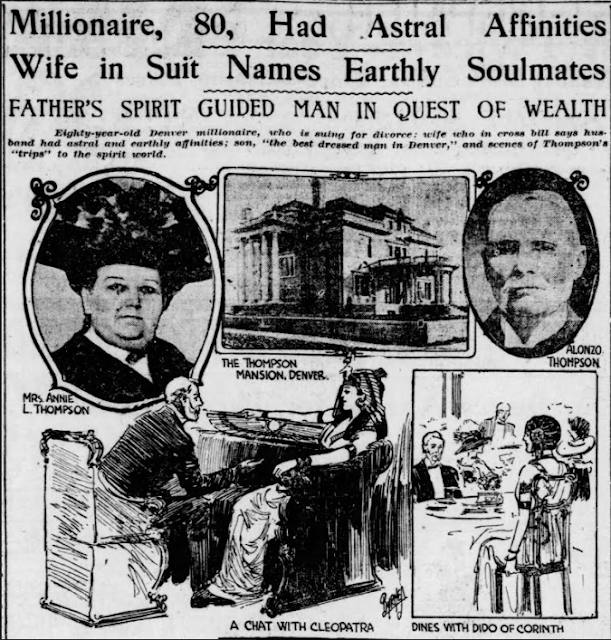 The only newspapers that mention her at all are ones that mention the legend, the ghost stories, not the events that supposedly took place in 1876. In my research I did find one family with that name, although they spelled their last name as Summerton. They also lived in San Francisco. The 1880 Census shows the father's name was George Summerton, and his wife, Matilda. George had two daughters from his first wife, Susan. Their names were Amelia and Elizabeth; however, neither one of the daughters disappeared. Another thing to note, the family did live in Nob Hill, but not on California Street. The Summerton's residence was located at 1417 Hyde Street, in between Jackson and Washington Streets, but again, these young ladies did not go missing. I hate to rain on anyone's parade but there are no records or documented facts that prove Nob Hill's infamous "lady in white" was this woman Flora Somerton. Again, it is highly unlikely this woman "Flora" ever existed at all. The "lady in white" stories go back centuries, leading us back into ancient folklore from Europe, such as France's "Les Dames Blanches." This tale is among the most popular in urban legend folklore that I have found in my research and writing. It appears every region has their own story of a mysterious "lady in white." So in ending....whatever is roaming California Street in the dark of night and whatever you choose to believe it to be, one thing is for sure: it isn't Flora Somerton. 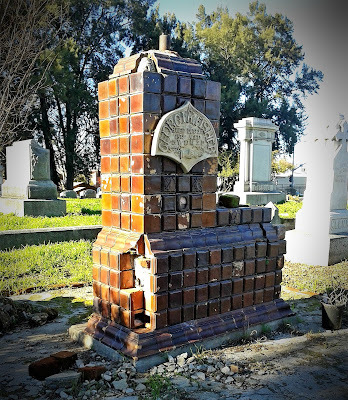 This monument sits at one of the higher points of the Historic Sacramento City Cemetery. Facing east on the northern section close to the Broadway entrance, it's ornate tile design is what caught my eye the very first time I walked by it. The sheer beauty of the monument is equally matched with the sudden feeling of sadness upon closer examination. It isn't just a sadness solely because of the tragic back story of the grave itself, but also the painful realization knowing how horribly this grave has been treated over the years. If we could have only seen the monument in its full splendor back when it was constructed, then we would be able to fully realize the love and craftsmanship -- literally blood, sweat and tears, it took to create such a masterpiece. 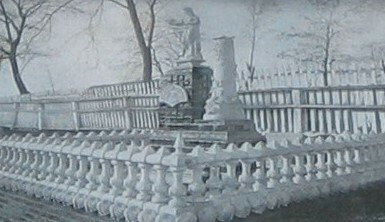 The monument was built for Georgia Fisher, a young lady, only 19 years old at the time of her death. The man who built her beautiful memorial was none other than her devastated groom-to be, Martin Bergman. The couple were to be wed on New Year's Day in 1876, but Georgia passed away just days before the wedding, on December 27, 1875. 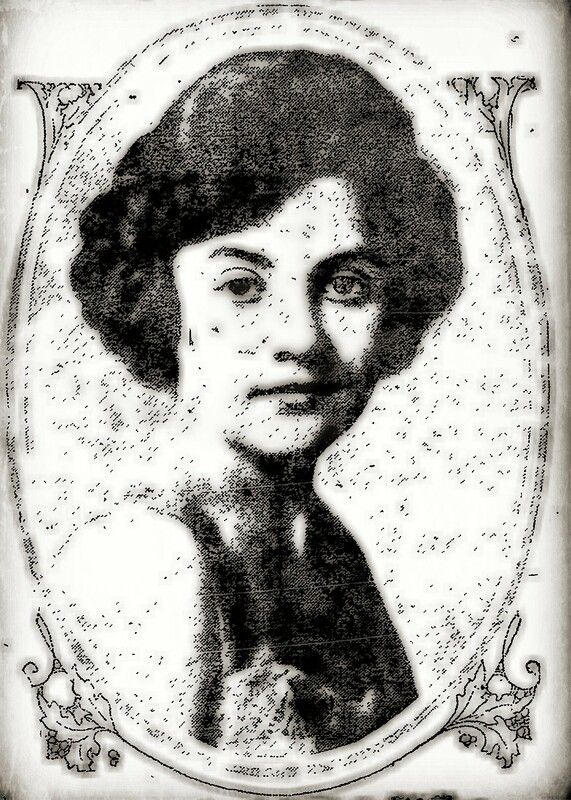 Georgia Fisher, or "Georgie" as she was sometimes called, was the only daughter of George Fisher and Narcissus Tucker. Born on February 25, 1856, in Louisiana, it appears that Narcissus brought Georgia with her to Arkansas at some point shortly after her birth, as the Tucker family: William Tucker and Paulina Adelina Humphrey-Tucker (Narcissus' parents), all traveled together in an ox-team of settlers across the plains from Arkansas to California around 1857-1858. Although I could find no records of a divorce or death, I believe George Fisher more than likely died, leaving Narcissus a young widow. It was after getting to California that Narcissus, a young single parent with an infant child to raise, married Thomas Kirtlan, a Blacksmith by trade. Their marriage date is estimated at around 1858, when Georgia was 2 years old. Kirtlan had originally been born in England, but came to the United States with his parents across the Atlantic as an infant. He was raised in Ohio, and there he learned his trade. By the time he was 19 years old, he traveled to California, via the Isthmus of Panama and settled in Jenny Lind (Calaveras County). He would remain there until 1869, when he moved his family to Sacramento to set up his new shop on Twelfth and K Streets. Eventually the family moved again, this time to Freeport, just south of Sacramento, along the Delta, near the other small towns of Clarksburg, Locke and Walnut Grove. Georgia was the eldest half sister of nine children born between Narcissus and Thomas Kirtlan. Around the age of 17 (1873-74), Georgia left home and went to work as a hired domestic for the Bergman family in Sacramento. Other records state that she had only been in the employ of the Bergman's for five months before her death, which would mean she came to work at the household at the age of 19. It is uncertain the exact date that she came to be employed in the Bergman household, but the fact remains that by 1875, she was working there. The Bergman sons, Johann and Martin, had came to California from their native Sweden in the late 1860s, after having been so impressed by a sample of California clay they had seen in Stockholm. The two potters were convinced that their future was in America, so they left everything behind to start a new life. The journey was long, crossing the Atlantic and then walking the Isthmus only to board another steamer to San Francisco, but their determination was unshakable. 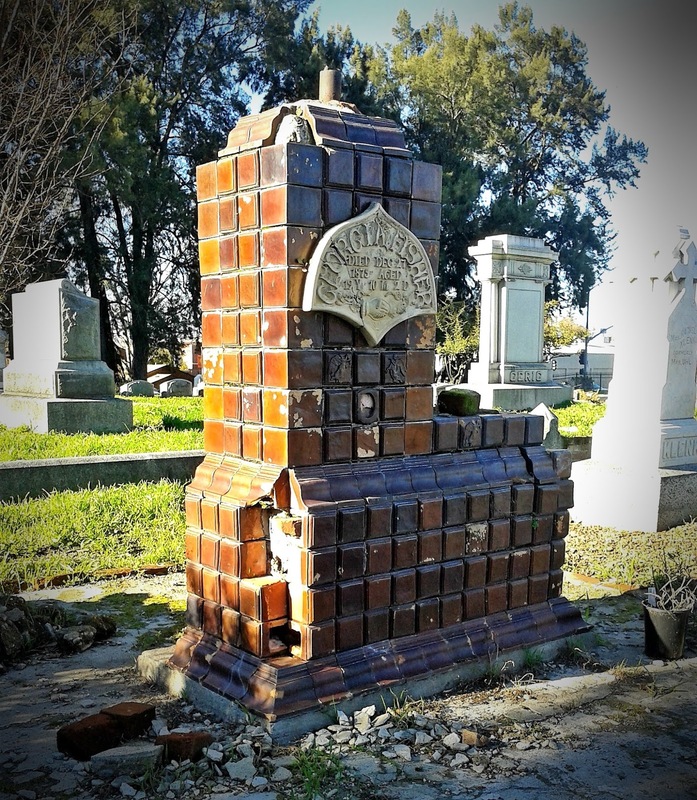 After settling in Sacramento, the two brothers set out to buy out their competition, Sacramento Pottery. The Bergman's began prospecting, not for gold, but for clay, finding a rich deep pocket of the best clay at Michigan Bar and Cook's Bar in Sacramento County (near Rancho Murieta). 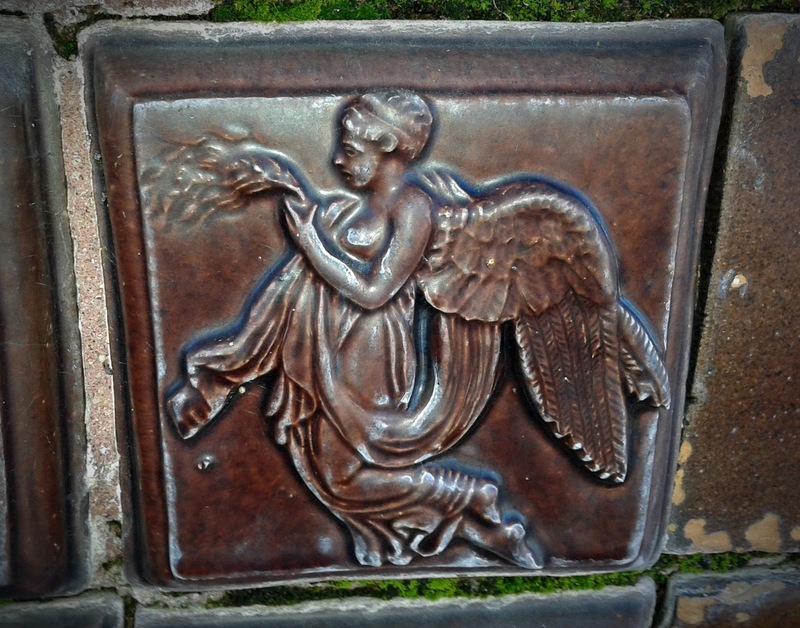 In fact, according to The History of Sacramento County, California, by G. Walter Reed, Michigan Bar was thought to be "the best bank of clay for pottery" in the entire state. The Bergman brothers became so successful that they paid for their parents and siblings come to California from Sweden. According to an article from the Sacramento City Cemetery's website, Georgia was hired by Mrs. Bergman, Martin's mother. Their home was located at 30th and N. Streets in Sacramento. It appeared that Martin Bergman fell for the young lady while she worked in their household, and although he was much older than her, Georgia reciprocated the feelings. According to a quote within the article, from a Bergman descendant, Pat Pors, it appeared that the family was quite happy with the union of the two, and they were preparing for the holidays and the upcoming nuptials said to have been scheduled at the Presbyterian Church (13th & N Streets) on New Year's Day. At some point during the hustle and bustle of getting so much done to prepare for the festivities, Georgia fell ill. Some say she died from typhoid pneumonia, while another genealogical report by Charles Wm. Berberich, another Bergman descendant, listed her cause of death as diphtheria or brain congestion/meningitis. I could not find any death record for Georgia, so I am undecided on which cause of death is certain. 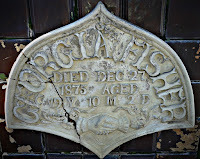 Either way, we know she fell ill and passed on December 27, 1875. Martin was devastated at the loss of his beloved Georgia, and so in his final act of everlasting love, he chose to construct for her the finest monument, made from the best materials, by his own hand. It was said that he worked tirelessly with tears streaming down his face to create a memorial worthy of Georgia, who undoubtedly was the love of his life. 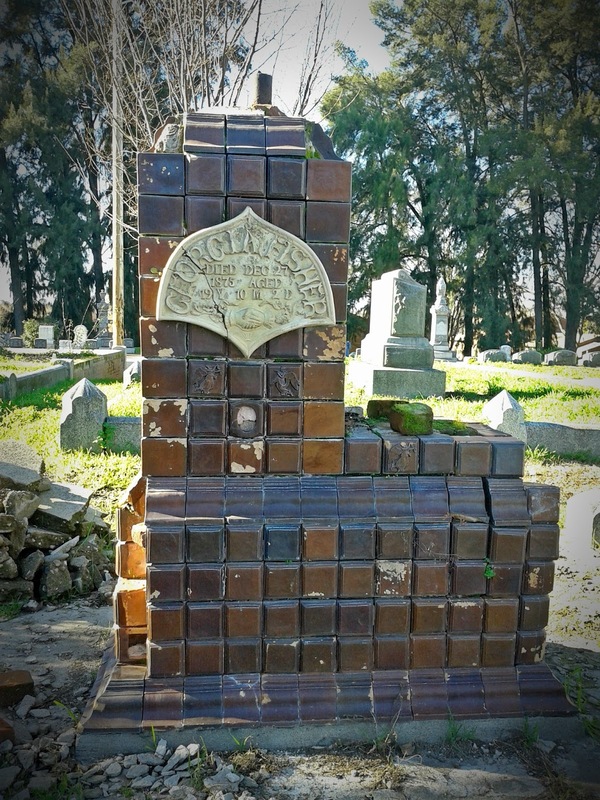 The plaque erected by the Old City Cemetery Committee in 2010, sits in front of the monument and summarizes the tragic love story for passersby to learn while strolling through the cemetery. According to the plaque, "Shortly after Georgia's death, Martin, together with his father and brother, created this monument on her grave site. 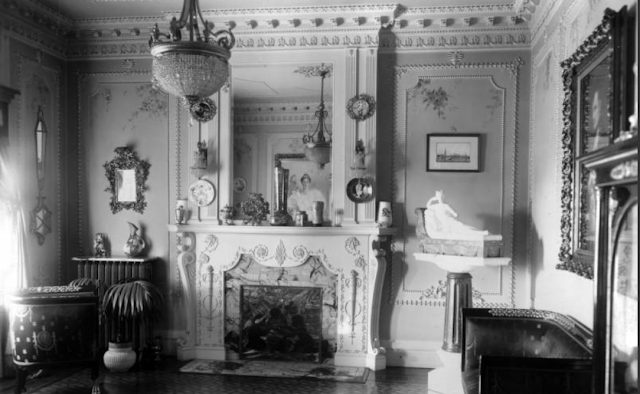 Martin, a Swedish immigrant sculptor, constructed the ornately tiled base. His father, John Bergman, added a statue of the angel Gabriel. Martin's brother, John, created an equally beautiful column. Together, they built an ornamented clay pedestal fence around the plot. Martin waited nearly 20 years before allowing himself to marry, in the 1890s. But even so, it appears that he and his wife became estranged over the years. When Martin died in Spokane, Washington, in 1920, he left all his estate to his only daughter, and nothing to his wife. 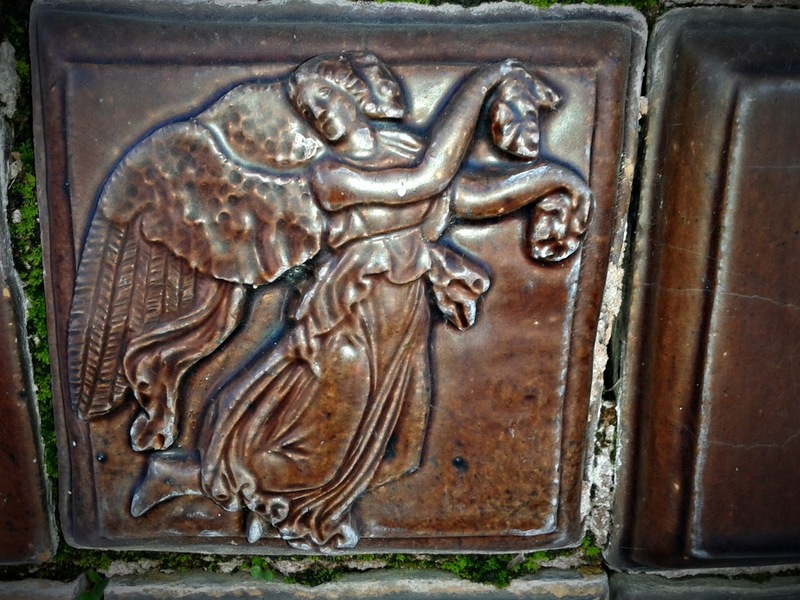 Martin Bergman was a very prominent potter and sculptor who truly made a name for himself in his lifetime. To date, the only known photo of Georgia Fisher is the one that was taken after her death. Originally posted on blog, Dreaming Casually 1/15/2017, republished on 4/8/2018. Photos of Martin Bergman and Georgia Fisher and monument from the Sacramento City Cemetery plaque. Individual Report for Martin Laurentius Bergman, by Charles Wm. Berberich. "It was Christmas Eve, 1919, in Louisville, Kentucky. 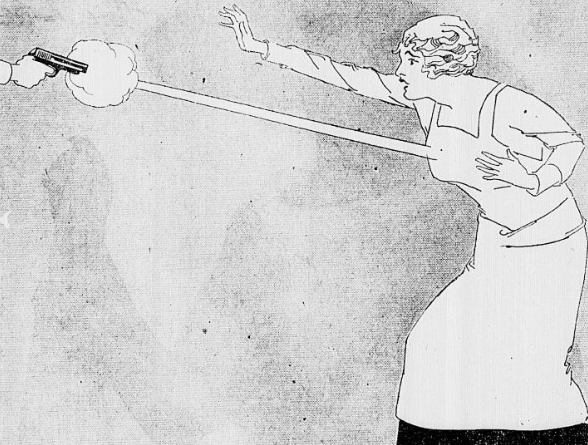 A young nurse by the name of Elizabeth F. Griffith was ecstatic. Her wedding was just days away, and she was about to become a new bride. Little did she know that this day would prove to be her last. The story surrounding the death of Elizabeth Griffith is one shrouded in a complex web of mysterious unanswered questions, scandalous behavior and lies. It appeared that during my investigation into this case, every time it seemed as though I had found answers, I stumbled upon even more questions and clues. After countless hours of researching every avenue I could find, I felt it necessary to bring back Elizabeth’s story from the dark abyss of forgotten ones, and shed light onto this ever perplexing mystery. 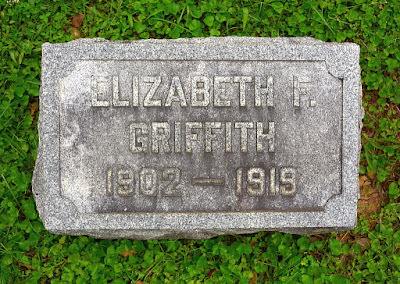 Elizabeth Griffith was born on May 13, 1902, to parents Martha McLean and John Griffith of Louisville, Kentucky. At the time of her death, seventeen year-old Elizabeth was working as an office assistant to a very prominent doctor in town, Christopher G. Schott. After her death, the newspapers brought up the fact that Elizabeth and Schott had briefly been engaged to be married, however the engagement was soon called off. Stories seem to differ on just who ended the relationship, although Elizabeth continued working for Schott at his office, so it seemed to the unsuspecting eye that the break up was amicable. As time went on, Elizabeth started seeing another male suitor, George Jordan, an Army Captain who was stationed at Fort Zachary Taylor, in Key West, Florida. The two hit it off, and eventually the pair were engaged to be married on Christmas Day. Unfortunately, due to changes in his military responsibilities, Captain Jordan had to postpone the wedding by a few days. Jordan chose to travel all the way to Louisville to see Elizabeth to break the news to her in person. According to his statements, she was happy and excited about the upcoming nuptials and seemed to be alright with the wedding date change to New Year’s Day. When he left her to go back to Fort Zachary Taylor, she was alive and well. Knowing the wedding was now a week away, Elizabeth continued on with her day as usual and went to work at the Dr. Schott’s office. It wasn’t until after 3:30 pm on that day, December 24, when everything changed. It was around that time that Elizabeth’s body was discovered in a locked back room of Dr. Schott’s office with a bullet through the heart. The gun, a .45 caliber revolver belonging to Dr. Schott, was found next to her body. It was ascertained that she had been shot from above in a downward trajectory, having been on her knees at the time of her death. In the middle of possibly pleading for her life, she took one bullet to the chest. The person who allegedly found Elizabeth’s body was none other than Dr. Schott himself, who was then accompanied by his thirteen year-old neighbor, Laurene Gardner. Schott claimed that he and his little companion, Laurene came to the office after driving around town for several hours, delivering Christmas gifts. After returning to the office he noticed the back room door was locked. Using his own key, he unlocked the door and found Elizabeth’s body in a pool of blood. Schott told the police that he was certain that Elizabeth had committed suicide. Detectives investigating found no evidence of suicide, but instead believed that the lack of powder burns on her body, clothes or hands proved that she was murdered. They also discovered a newspaper clipping in her pocket, which led to even more questions. In other words, besides mentioning there was some sort of “eternal” love triangle, he was also attempting to sully her reputation by claiming that Elizabeth was getting high on the doctor’s supplies. Interestingly though, Dr. Schott offered more information with that one statement than he would realize. This will be discussed later on in this chapter. According to his statement, Dr. Schott claimed he was happy for Elizabeth’s upcoming marriage and that he felt it would be a good “trial run” for the marriage he believed would take place in the future between the two of them. It was apparent that although he made remarks that Elizabeth was obsessed with him, it was clearly the opposite. Friends of Elizabeth said that she had ended the engagement with the doctor claiming she was actually afraid of him, and that she was too afraid to quit her job, at least until she was married. Investigating the dynamic of Schott and Elizabeth’s past relationship reveals much more. One of Elizabeth’s friends, Anna Boswell, did not like the doctor one bit, due to his bad reputation. This caused the two friends to avoid conversation about Elizabeth’s relationship with the doctor. Nurse Cohan, another close friend of Elizabeth, was quoted in the newspapers. She recalled one night when she, Elizabeth, Dr. Lee Botts and another young gentleman were out for dinner and a show. It was later explained to the group that “George” was a man that Dr. Schott had hired to shadow her everywhere. It seemed that the doctor had serious insecurities and trust issues, and this caused Elizabeth not only to resent him, but to fear him for his out of control jealous nature. Could the good ole’ doctor have hired George to commit the dastardly deed, murdering poor Elizabeth? "Did you ever stop to think that the time would come when I didn't want to come back? You seem to think you can have me or leave me at will. I'll admit that I waited, hoped and prayed during my first three months that you would come back to me, but now it could not be if you wished it. Your unjust suspicions today settle the question forever. Didn't you tell me that you had a different girl every night, and when I merely go downtown to supper you say that everything is not on the level? Had I never gone with any one and let you do all the going, you would have found some other excuse. They are nothing new. I have been fed up on excuses and promises for the past three years and let me relieve you of responsibility of making more, for I have forgotten the place where I do not even want to return. It doesn't matter to me if you come or go. It's hell to feel that way, and I never thought I could feel any other emotion but love for you. Don't ever think of me personally again, as I have already schooled myself to an impersonal feeling for you. I want to keep on fixing your books and I want some money, in fact, need it. I don't mean to borrow it, as I feel that I am earning a little bit working on the books. It doesn't matter how deficient I was, it will be hard to find another girl to help you as I did and be as true as I was, considering everything, and I realize, too. You just want to get something on me so you can go around and talk about me as you did Jennie Cole, and I have been good to you, too, but I see that it is all you are after. If that is gratitude and appreciation, well.”- "Elizabeth Griffith." By his own admission, Dr. Schott claimed that during his time engaged to Elizabeth, he hired a private detective to shadow her wherever she went, out of fear that she would be unfaithful. During the time he was being held, Dr. Schott remained somewhat arrogant in his stance. He even went on record for the newspapers intimating that he expected to be released immediately and “to be calling on patients again” by New Year’s Eve. “They have not even proved Miss Griffith was murdered,” Schott told the press. The Richmond Times Dispatch offered a full page spread on their take of the story. This included information that clearly pointed to the doctor as the best possible suspect and the theory of how it took place. 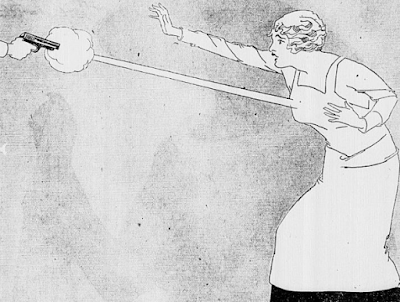 “More probable that this is the theory that Elizabeth Griffith– a high-spirited, courageous girl, as all her friends say– snatched the weapon from the doctor’s table and wielded it first herself in an effort to force her tormentor to cease the threats to go to her sweetheart with the stories of her past. A struggle followed and the weapon was wrested from Elizabeth’s hands. She fell to her knees to plead for mercy, but her prayers went unheeded, for a mad rage at this unexpected show of resistance nerved the hand that now held the automatic. The trigger was pressed, the muzzle spat fire and the ill-fated little bride-to-be was suddenly transformed into a ghastly bleeding corpse.”—- Richmond Times Dispatch. During the inquest, witnesses came out of the woodwork favoring both sides. Some claimed they saw the doctor coming to the office around the same time he claimed to have found her body. Another person, a patient of Dr. Schott, Mrs. Paul Stone claimed that she called the office about an hour before Elizabeth’s alleged time of death, claiming that Elizabeth was depressed and had mentioned she didn’t have anything to live for. She stated that Elizabeth told her that the wedding was postponed because her fiancé’s mother was out of town visiting his sister and he refused to be married without his family present. 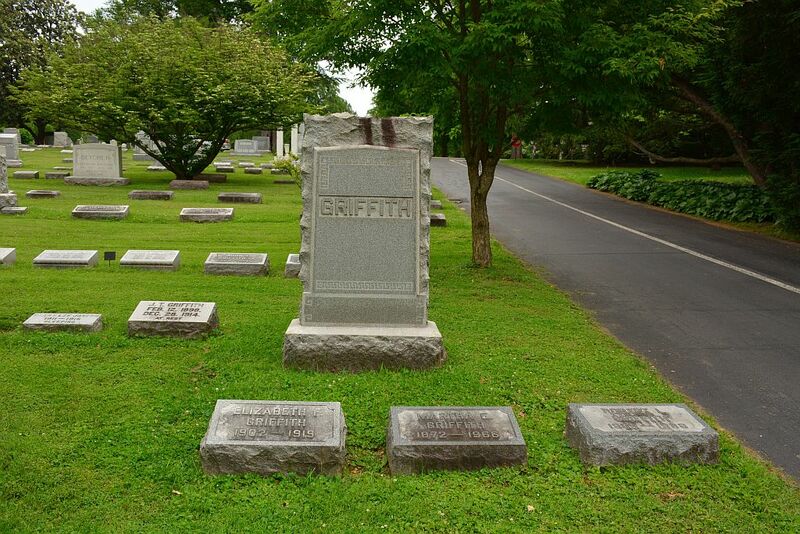 During an era when a sense of propriety was expected from everyone, it seems very unlikely that Ms. Griffith would have expressed her emotional state to a patient over the phone in a casual conversation. Not only would it be unlikely, but unprofessional for that time period. The only thing I could imagine was perhaps Dr. Schott had leverage on certain “witnesses” in his defense, and possibly threatened exposure of personal secrets had they not gone along with his story. After all, most people disclose personal information to their doctor that normally they would never share with others, and in a pinch the doctor could have easily blackmailed certain people to help aid in his alibi or defense. It seemed that the doctor was shady, hiring men to shadow Elizabeth, and from her own letters to the doctor she mentions that he was trying to “get something” on her, in order to ruin her reputation. The newspaper clipping found in her pocket eluded to that very thing. But what was it that Dr. Schott knew about her that no one else did? And was that information something the doctor held over her head and threatened to take to her new husband-to-be? When it came down to questioning all the eye-witnesses in the case, not all stories matched up. William J. Ryan, a local baseball umpire, claimed that he saw the doctor leaving his office around 3:30p.m. This was the opposite of what Schott had previously stated. He claimed his arrival was around that time, which would put him at the scene of the crime at the time of Elizabeth’s murder. Whether Schott was there or not, he could have easily made that alibi, knowing all too well that he had hired someone to do the job for him. 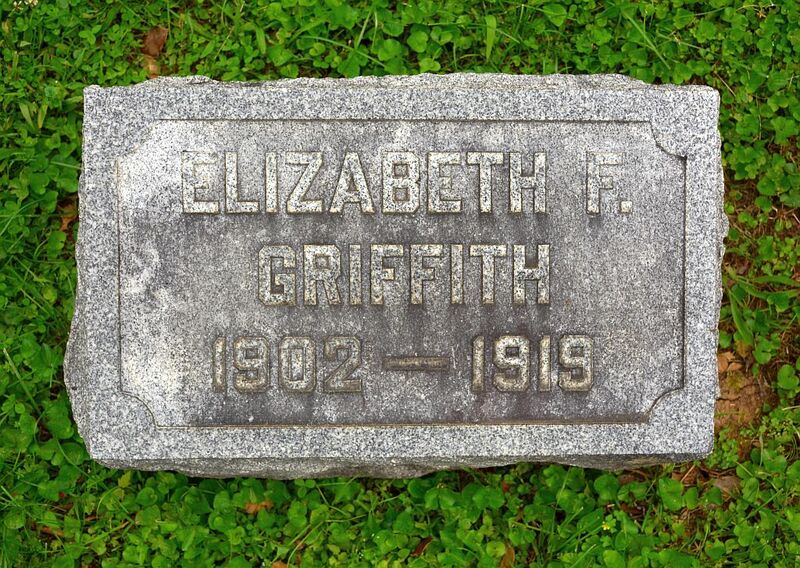 Elizabeth’s sister, Kate Griffith was quoted in the newspapers explaining that she had called the office around the time that coroner’s claim Elizabeth had died, and that Dr. Schott had answered the phone at his office. She also was very insistent that Dr. Schott had some sort of hold over her sister and she was unsure why. With all these conflicting statements, it seemed the doctor’s story wasn’t adding up that well. He did have one trick up his sleeve. That was his little companion, thirteen-year-old Laurene Gardner. Her testimony at the grand jury hearing gave him an alibi. I found it quite interesting that at the very same time the detectives were searching for more witnesses to question in regards to the case, a discomforting headline pops up connected to the story, “Girl Takes Life To Escape Going To Witness Stand.” Could that actually be? Was there another girl, dead? The Appleton Daily Post, for January 9, 1920, stated that a young lady by the name of Theodosia Saunders was found dead in her house. It was suspected that she took her life to avoid speaking to detectives or to Dr. Schott’s attorneys about her possible knowledge of Elizabeth’s death. I tracked down several newspaper articles mentioning this tragic turn of events, all of which seem to be conflicting. Although some state that Miss Saunders killed herself to avoid being named a witness, others claim it was accidental, and that she had been ill with tonsillitis and was self-medicating. According to the papers, her personal doctor came by earlier in the day to check on her and left his medical bag there by mistake. Later on, Theodosia’s mother found her body with a handful of chloroform soaked cotton. It was apparent that she had died from inhaling the toxic fumes. Theodosia’s death certificate states it was accidental overdose of chloroform poisoning. It is quite odd that she died the very same way in which Dr. Schott claimed he had once found Elizabeth in his office, as I previously mentioned. Another thing I found strange about Schott’s statement was the fact he even mentioned the chloroform at all. Was that a slip up by the doctor? Did Theodosia really accidentally overdose on the chloroform? Or was her death just as questionable as the way Elizabeth died? This story seemed to take me even further down the rabbit hole with a sense of uneasiness along the way. How did Theodosia fit into the story? What did she know that perhaps cost her life? Why did Dr. Schott, a middle-aged man, choose to take a thirteen year old girl with him to deliver Christmas gifts alone? And how did Elizabeth end up in a locked room in the doctor’s office, to which only he had the key? There were even more questions. What was the cryptic newspaper clipping found in Elizabeth’s pocket all about? Was that sent to her anonymously by an ex-lover? Or perhaps a jealous woman who had affections for one of Elizabeth’s male suitors? I found myself theorizing so many possible scenarios in both Elizabeth and Theodosia’s deaths. Records indicate that Dr. Schott had been released from police custody a few days prior to Theodosia’s death, and newspapers relay that Dr. Schott did stop by Theodosia’s home to give her parents his condolences, so he obviously knew where she lived. Was he that desperate to have been involved in her death, too? Or did her death have nothing to do with Elizabeth’s death, and was just merely coincidental? After all the incriminating evidence and suspicious circumstantial evidence against the doctor, ultimately the grand jury accepted the alibi given to them by the little girl, Laurene Gardner. After dismissing all murder charges against the doctor, Elizabeth’s death slowly to faded in the papers, and over time became forgotten. Her friends and family could find no reason that Elizabeth would have killed herself. Her wedding was days away and her new life was in clear view. By newspaper accounts prior to her death, it shows Elizabeth’s personality to be adventurous, spirited and fearless. She was mentioned five months before her death as being a volunteer passenger on an JN-4 airplane that was delivering newspapers to Shelbyville, Lexington and Frankfort. The pilot admitted that she asked him to perform stunts such as tailspins, flip-flops, nose dives and barrelrolls. She seemed to be full of surprises and open to exciting new things. To imagine that someone as spirited as she was would end her life when she was fully capable of making any choice she wanted, just doesn’t add up. It was so clear that she had been murdered, even the newspapers expressed their opinion of it; yet, it seemed that Dr. Schott was out of the reach of the law. How did he manage to get away with it? Dr. Schott owned nine properties in town and the Gardner family rented one of those properties. In fact, they lived just next door to the doctor. As I had mentioned before, perhaps Schott threatened his “witnesses” to help provide an alibi for himself. Something as serious as threatening to throw them out on the street could have been used as leverage to persuade the young girl to lie to the grand jury, giving him a solid alibi. Of course, that’s just speculation. Again, he could have very well been with Laurene as he stated, all the while a hired gun could have been waiting for Elizabeth in the office. And where does Theodosia fit into this story? Did she know something crucial to the case and thus she needed to be silenced, for fear that the truth could come out? Or was her death just a coincidence? It seemed so unfair to think that if Dr. Schott was responsible for ending these two young women’s lives, how was he was able to get away with it? Fast forward to April 16, 1928. We find that Dr. Schott now has his own sanitarium for the treatment of opium and morphine addiction in Louisville, at the same location where Elizabeth’s heinous death had taken place only nine years earlier. Schott is much older now, a heavy drinker and a tyrant of an employer. Abusive to both patients and employees, even making inappropriate sexual comments towards women in public. It seemed the doctor’s true colors came out eventually with time and carelessness. After verbally abusing the cook for misplacing a key, one of the male nurses on staff, Dan Newman, approached Dr. Schott and stood up to him, making it clear that his abuse toward his employees would not be tolerated. This did not sit well with the doctor and it immediately created tension between the two men. This continued for several weeks. 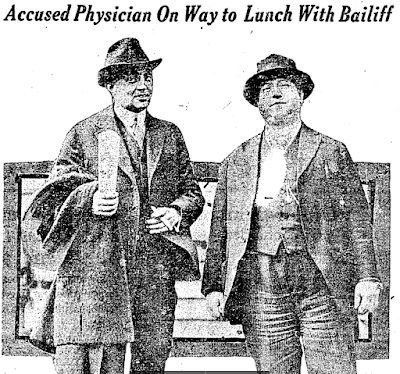 According to the Brooklyn Daily Eagle, dated April 17, 1928, after watching Dr. Schott bring in an unidentified woman, who was not a patient to the sanitarium, abusively dragging her across the floor and screaming to his employees to “put her to bed,” Newman had enough. After some heated words were exchanged between the two, Newman felt his life was in danger, so he went to his room and retrieved his pistol to keep in his pocket for his own safety. According to testimony by Newman, a drunk Dr. Schott had previously bragged that he had gotten away with killing Elizabeth Griffith many years ago, as well as knocking off a fellow physician, too. Perhaps after realizing he had once shared too much information with Newman, Schott felt that his livelihood was now threatened. When the two met again that evening, their argument started again. When Newman witnessed the doctor reaching into his own coat for what he believed was a weapon, the nurse was quick on the draw, pulling his own pistol out and shooting the doctor down, dead. After the deed was done, Newman called the police and confessed to the events that had taken place. A jury freed Dan Newman on June 14, 1928, dismissing the murder charge and citing that he had acted in self defense. One can only imagine that perhaps some of thejury members from the community, who remembered Elizabeth Griffith’s case, may have been relieved that justice had in a round-about way been served. After all, it was better late than never. (ISBN-13: 978-1523981175 ISBN-10: 1523981172) Copyright October 17, 2016. All rights reserved. All rights reserved. J'aime Rubio identified as the AUTHOR and PUBLISHER of the work in accordance with all U.S. Copyright laws. No part of this publication may be reproduced, stored in a retrieval system, or transmitted in any form or by any means without prior written permission by the author/publisher.